my history – since I was 14 years old my life has been dedicated to surfing! It was during my competitive career that I started to develop my keen interest in shaping which began when I was 17, in 1987. During the past 28 years I acquired a B.Soc.Sc degree throughout which my surfing and shaping blossomed. Being a 3x South African surfing champion and 3x national team member has allowed me to utilize my knowledge of performance surfing to produce functional shapes for surfers who need them. Now aged 46, with my wife and 2 kids who love the beach we are about to embark on our next exciting journey to Australia and create the new face for GERAGHTY surfboards with it’s head office in Queensland. 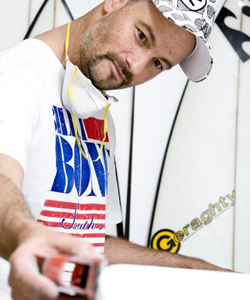 After shaping 14500+ boards, my skills have become well designed to benefiting my clients and establishing the Town & Country and the Geraghty/Surfshapes brands both here in South Africa, and now for Geraghty in Australia going forward from 2012. Stay Stoked & Go Surfing!